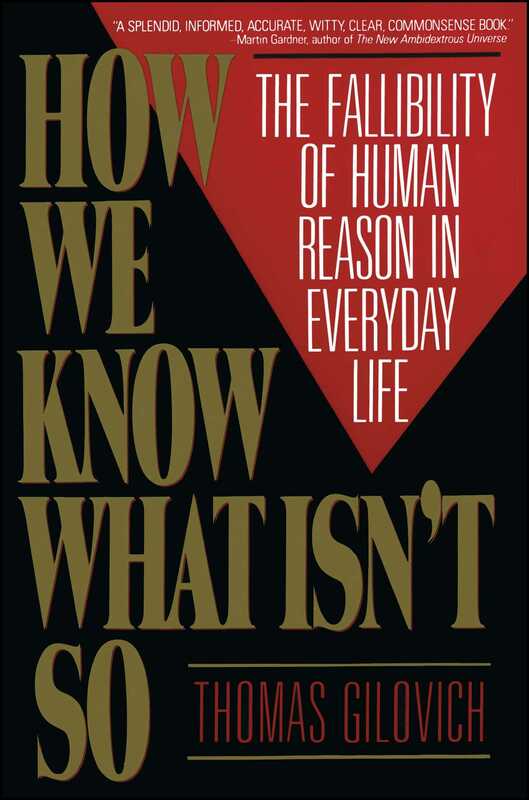 Thomas Gilovich offers a wise and readable guide to the fallacy of the obvious in everyday life. When can we trust what we believe—that "teams and players have winning streaks," that "flattery works," or that "the more people who agree, the more likely they are to be right"—and when are such beliefs suspect? Thomas Gilovich offers a guide to the fallacy of the obvious in everyday life. Illustrating his points with examples, and supporting them with the latest research findings, he documents the cognitive, social, and motivational processes that distort our thoughts, beliefs, judgments and decisions. In a rapidly changing world, the biases and stereotypes that help us process an overload of complex information inevitably distort what we would like to believe is reality. Awareness of our propensity to make these systematic errors, Gilovich argues, is the first step to more effective analysis and action. Thomas Gilovich is a professor of psychology at Cornell University and author of The Wisest One in the Room (with Lee Ross), How We Know What Isn’t So, Why Smart People Make Big Money Mistakes, and Social Psychology. He lives in Ithaca, New York.